It doesn't get much netter than this. Link Wray live from a studio, exactly as aired by legendary Bay Area FM pioneer KSAN. The performance is hot and very live! Great sound, incredible playing, and ultra square wave distortion. maybe someday, this will be released commercially. Major distortion, super square wave fuzz, thundering crunch. 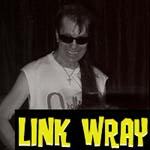 This is Link Wray at his noisiest! His performance is awesome, and the sound is great! On his recent tour, Link blew us all away, but he never hit the hot button like this! Unbelievable! As with the killer "Rumble," this tracks pummels the grit out of you, and is electrifyingly hot. The man is a monster on guitar! I'm so glad he's back at it!